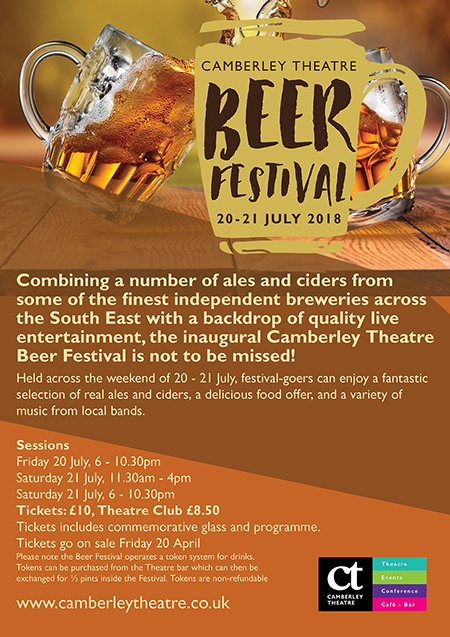 Combining a number of ales and ciders from some of the finest independent breweries across the South East with a backdrop of quality live entertainment, the inaugural Camberley Beer Festival is not to be missed. Held across the weekend of 20-21 July, festival-goers can enjoy a fantastic selection of real ales and ciders, a delicious food offer, and a variety of music from local bands. Download the list of beers we'll have on offer! Already booked for the Beer Festival? Pre-order your beer tokens here and save time and money! The Beer Festival operates a token system for drinks. Tokens can be purchased from the bar which can be exchanged for ½ pints inside the festival. You can pre order 8 drinks tokens for £15 to save time and money on the night. Additional tokens can be purchased on the night priced at £2 from the Theatre bar by cash or card. Tokens are non-refundable and are sold in blocks of 4. Pre-ordered tokens can be collected from the Theatre Box Office upon arrival.